Enjoy challenging sessions of Chess! "3D Chess" invites you to challenging sessions in amazing 3D worlds against your computer or friends, from ancient Greece to spooky graveyards. For even more of a challenge test your mettle in our chess puzzle mode with its different levels of difficulty: Finish frozen sessions within a fixed number of turns. Find the best way to victory to unlock more and more new puzzles. 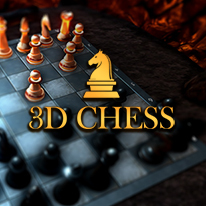 "3D Chess" features a strong AI and numerous comfort options (such as turn suggestion, undo turn, notations, turning the board and much more) to make every session an unforgettable experience, no matter whether you're playing against your computer or friends on the same PC. A chess rule wiki rounds off the package and provides you with fascinating insights into the game's rules.